Radiation cured products are obtained by the process of radiation curing that can be modulated to fit in a broad range of applications. Key radiation cured products include coatings, inks and adhesives. These coatings, inks and adhesives find further applications in end-user industries such as wood, paper, glass, metal etc. The revenue generated by the global RCP market was USD 4,938.5 million in 2012. This market is expected to reach USD 7,930.1 million by 2019 and is anticipated to grow at a CAGR of 7.0% from 2013 to 2019. Radiation cured coatings accounted for the largest share of the Radiation Cured Products market in terms of both volume and revenue in 2012. Radiation cured inks was the second largest product segment of radiation cured products followed by radiation cured adhesives. The RCP industry exhibits high degree of backward integration as majority of RCP producers are also engaged in the production of its feedstock materials. This backward integration gives these participants a distinctive competitive advantage in terms of raw material procurement and supply. The radiation curing process is instantaneous and requires very less time as compared to the conventional thermal curing process, hence it is used for a wide range of applications. Global demand of RCP is mainly driven by the environmental compliance of this technology and increase in the infrastructure activities that have led to a rise in demand for wood coatings. Radcure technology produces very little to no waste and the waste so produced is disposed of as ordinary waste. The process requires less space, time and energy as compared to other curing technologies. Large market share and steady growth rate are a result of the instant curing times and improved productivity offered by radcure coatings that help to increase the cost effectiveness of the process. Radiation cured inks is the other important product type produced by the radiation curing process. The transition towards energy cured inks and high value digital inks are expected to drive the market of radcure inks in the near future. The major end users of radcure inks are packaging and printing industries. The growth of RCP market is likely to be restricted by factors such as rising raw material prices. The raw materials used for making RCP are different oligomers and monomers which are crude oil derivatives. The crude oil market is always fluctuating and is uncertain and therefore involves a high price and supply instability. Asia-Pacific and Europe were the major markets for RCP in 2012. With around 40% share in total demand, Asia-Pacific was the largest regional market for RCP in 2012. Leading RCP manufacturers have concentrated on capacity expansion in Asia Pacific to increase their yields and revenues and cater to the increasing demand. The RCP market witnessed a significant decline in demand due to the global economic downturn during 2008 and 2009. However, it has witnessed steady rise in demand since 2010 due to the uptrend in end-user industries following revival of the global economy. In the recent past, industry participants have shifted their focus on capacity expansion to increase production capacities of their respective facilities. 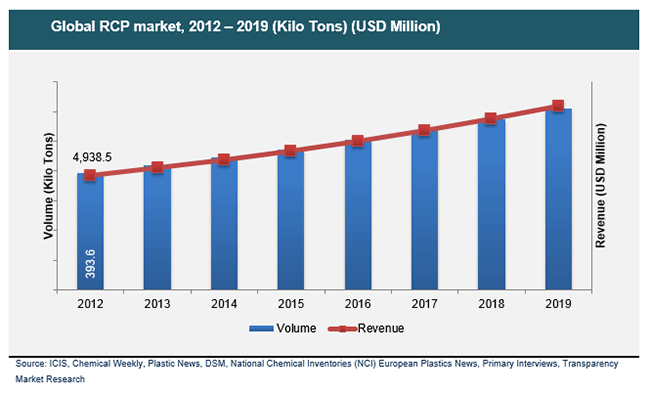 Looking into the growth trends in the end user industries such as wood coatings, packaging and textiles, RCP manufacturers are focused on capacity expansion. Some of the key market participants operating in the RCP market include Ashland Inc., BASF SE, Bayer MaterialScience, DIC Corporation, Cytech Industries etc. The extensive application of radiation cured products across various industries has boosted the radiation cured products market. The report presents a detailed study of the market and forecasts the market growth and valuation during the period between 2013 and 2019. The report points out the key drivers and restraints affecting the growth of the market and mentions the various opportunities for the market to grow during the forecast horizon. Analysis of market attractiveness as well as the impact of Porter’s five forces on the market has been discussed in the report. The report categorizes the global radiation cured products market on the basis of the products. The report studies each of the product segments and assesses the demand for the products in the near future. The report further studies the overall market across key geographical regions and analyzes the demand for radiation cured products in each region. Vendor landscape of the market has been discussed and some of the key players have been profiled in the report. Radiation cured formulations are cross-linked by high-intensity UV light or electron beam energy sources. Radiation cured products are better than thermal cured products, as they consume less energy, are rapidly cured and dried, and display excellent hardness and abrasion resistance. Radiation cured coatings, inks, and adhesives adhere well to a surface and last long. The report points out that stringent environmental regulations have led to the growth of the global radiation cured products market, which uses solvent-free formulations in radiation cured products. Production benefits and cost advantages of radiation cured technology have further propelled the market. The report mentions that the growing wood coatings market is expected to boost the growth of the overall radiation cured products market. However, the report cites escalating raw material prices as a possible hindrance to the growth of the global radiation cured products market. Monomers and oligomers derived from crude oil are the major raw materials used in the radiation curing process. The volatile prices of crude oil will negatively impact the manufacture of radiation cured products. The overall market has a huge opportunity to grow with the increasing use of biobased materials for radiation cured products. The report segments the global radiation cured products market on the basis of products such as inks, adhesives, and coatings. Radiation cured coatings had the highest demand in 2012. The report further studies the radiation cured products market across key regions such as Asia Pacific, North America, Europe, and Rest of The World. The report projects Asia Pacific to be the leading regional player during the forecast horizon. The report compiles detailed information about some of the key players in the global radiation cured products market, such as BASF SE, Ashland Inc., Cytec Industries Inc., Dymax Corporation, Flint Group, Lord Corporation, and Toyo Ink SC Holdings Co. Ltd. The report mentions the financial overview, business strategy, business overview, and product portfolio of the key players. Through SWOT analysis, the report projects the growth of the major market players during the forecast horizon.